Writing about pleasure—the how and why of enjoying something—is tricky, because doing it properly involves acknowledging and interrogating certain values that are often presumed to be shared, but are in fact personal. Seemingly instinctual, gut-level reactions are aways built upon a complicated foundation of memories and values; the more basic a response seems, the harder it is to untangle. The invigorating, dispiriting, frustrating, meaningful thing about writing film criticism is that it forces you to disassemble these personal reactions; everything works for a reason, and sometimes that reason is you. The hardest part—and this is especially true if you happen to be toiling in a first-person-free-zone like the A.V. Club film section—is reassembling them in a way that will be valuable to the reader. The full-stop “I like it” doesn’t cut it. 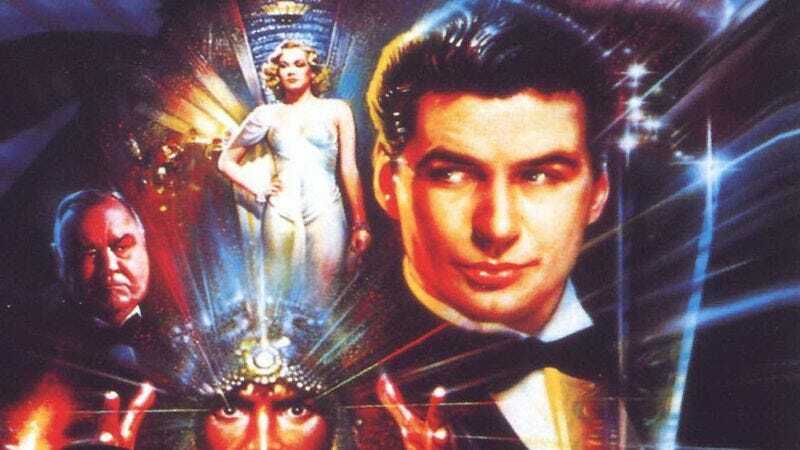 Which brings me to Russell Mulcahy’s Orientalist art deco pulp fantasy The Shadow, one of the more notable box office flops of 1994, and a movie that I’ve liked for a long time without ever really thinking very hard about why. To me, the film offers a surfeit of self-evident, movie-specific pleasures: matte paintings, miniatures, and sets designed around forced perspectives; animated opening credits that gradually reveal the title; a lengthy explanatory crawl; screwball banter; the voices of Tim Curry, James Hong, and John Lone; a motif-based score that mixes blaring horns and swelling strings with reverb MIDI; foggy, stylized lighting, with an emphasis on rich, electric blues; Dutch angles; a climax that grows more and more abstract with every scene; shots where elevated trains hurtle by in the background, raining sparks down onto a rain-slicked street. Do I enjoy The Shadow as much as I do because it conforms to my ideas of pleasure, or do I hold these ideas because I saw The Shadow a good two dozen times between 1995, the year I first rented it, and 1998, the year that our local video store caught fire? The first option is a dodge; it pretends to explain taste, but really just spirals back in on itself. The second option seems grossly over-simplified, and raises more questions than it answers. One of the biggest traps you can fall into while writing about popular culture from a personal angle is to conflate your past with your tastes, creating a tautology that effectively states that you like something because you liked it. I think that my fondness for The Shadow—a movie that’s never been a top-tier favorite, but which I like exactly as much now as I did as a VHS-crazed kid—is justified. As a grown-up critic, I still consider it to be a pretty damn good movie, for reasons that have everything to do with a certain kind of pleasure that comes from appreciating surfaces. The Shadow is one of the oddest movies to ever try to pass itself off as a blockbuster. A product of the ’90s superhero boom, when studios far and wide were trying to figure out how to replicate the success of Batman and Batman Returns, it nearly outdoes Tim Burton’s Caped Crusader films in terms of expressionist visuals and crazy-quilt narrative texture. It’s become popular to say that Burton’s movies, with their detours into horror and macabre comedy, could never get made today. The Shadow is a similar mutant relic; it represents a time when studios weren’t necessarily more adventurous, but were more willing to take risks on certain genres because they hadn’t yet figured out a formula for selling them. Alec Baldwin—who, now that I think about it, could’ve made for a great Batman and a great Bruce Wayne—plays Lamont Cranston, a reformed opium kingpin fighting crime in a stylized 1930s New York populated almost entirely by character actors. Cranston, who quit his murderous ways after being kidnapped and schooled by a Tibetan Lama, is supposed to represent the fundamental evil of humanity, repurposed to do good. However, Baldwin’s performance—all sultry low notes and cocky charm—never suggests a man fighting his nature; multiple dream sequences try to visualize his inner struggle, but instead register as nothing more than textural kinks. In effect, their conflict—which eventually comes to involve a nuclear bomb hidden in a skyscraper that all of New York has been hypnotized into ignoring—is more textural than dramatic. It provides the movie with a slippery, banter-heavy surface. Their final showdown arrives in the form of one of the most abstract sequences to appear in a Hollywood movie in the last few decades. The bomb—which resembles a giant pinball—rolls across a tilting floor, down a series of maze-like hallways. Once it’s caught, Cranston and Khan square off in a hall of mirrors; the sequence frames them against cracking split-screens and composited panes of shattering glass. The story goes that Mulcahy originally envisioned a more conventional-looking climax, but the set built for the scene was destroyed in an earthquake. It’s one of those cases where a production setback produced something more imaginative than originally intended, an amped-up riff on the ending of The Lady From Shanghai. Mulcahy’s career never recovered from the movie’s underwhelming reception, leading him to slump further and further, from direct-to-video features to TV movies to his current gig directing episodes of Teen Wolf. He remains one of the great unsung visual stylists of the era, best remembered for his music videos, which dominated ’80s MTV, and for his Stateside breakthrough, Highlander. Which brings us back to the pleasure of surfaces and textures. In the 1970s and early 1980s, a certain breed of old-school auteurist made Brian De Palma their favorite whipping boy, criticizing his work—sometimes rightly—as over-focused on “surface effects.” (The Shadow, by the way, was shot by longtime De Palma cinematographer Stephen H. Burum, and has the Steadicam POV shots and split diopters to prove it; Koepp, in the meantime, wrote Snake Eyes and Carlito’s Way.) When I try to remove myself from my experience of The Shadow and imagine what it’s like to enjoy the movie in a kind of vacuum, I’m struck by the way it designs itself around appreciating surface effects as purely as possible. Every situation is intentionally undercut by comedy or Grade-A scenery chewing. Mulcahy strikes me as a more truly surface-oriented filmmaker than De Palma, and the reason I think The Shadow is his most perfectly realized film is that it deflects any kind of invested emotional appreciation, always bouncing the viewer back to that glossy surface. If that sounds shallow, it’s because it is; The Shadow is a shallow movie. Shallowness, however, isn’t always a flaw. It’s a way to continually foreground contrasting and mutating audiovisual textures: Lone and Baldwin’s voices dancing around each other as they banter; faces being transformed by a combination of makeup and morphing effects; synths latticed over a string orchestra; miniatures towering over people; sparks raining in the background. Many of these are too abstract to qualify as acquired tastes; rather, all a viewer needs to enjoy The Shadow is a willingness to appreciate something purely on the basis of texture. What the hell were any of us thinking making the terrible Batman Forever a huge hit?